I love working in Otolaryngology-Head and Neck Surgery as a specialty because of the very wide range of patients I can see and get to know. There are so many different and interesting problems in this field, and I find it very satisfying to be able to help solve them. Dr. Tang is a North Carolina native who grew up in Cary. She obtained her B.A. in Biochemical Sciences at Harvard University and her medical degree from the Johns Hopkins University School of Medicine. She completed her residency in Otolaryngology – Head & Neck Surgery at the New York-Presbyterian Hospital Columbia and Weill Cornell campuses. She joined Fayetteville Otolaryngology in 2015. She maintains surgical privileges at Fayetteville Ambulatory Surgery Center and Cape Fear Valley Medical Center. 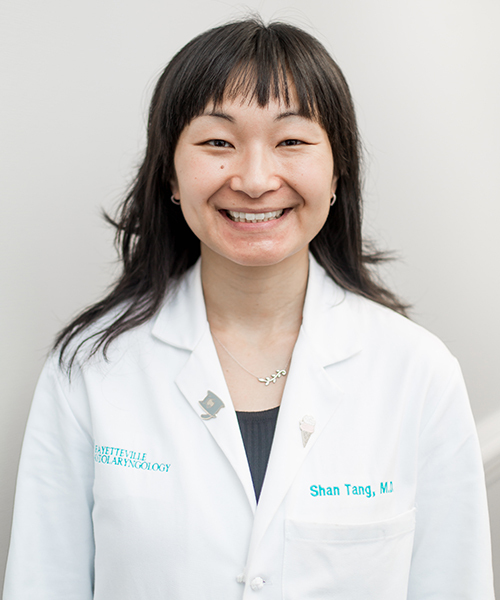 Dr. Tang enjoys trail running, physical fitness, cooking, reading, and meeting new people.